Named after the French and invented by the Belgians, the Dutch certainly love their fries no less than these nations and make and consume them in masses. Many restaurants serve them as a side dish and there is a snack bar with French Fries on just about every corner. But where can you find the best French Fries in Amsterdam? 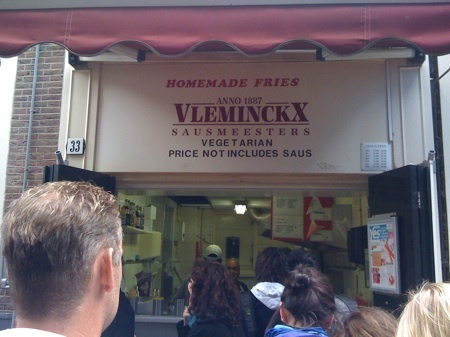 Somewhat surprisingly, but undisputedly, hole-in-the-wall Vleminckx on Voetboogstraat makes the most delicious fries in my city, and possibly in the whole world. 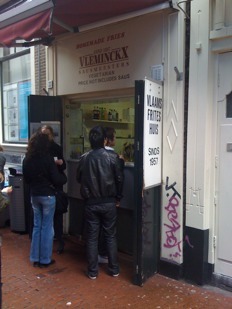 Vleminckx is amazing and certainly deserves its spot on dutchgrub’s best authentic Dutch restaurants in Amsterdam list. It’s basically a small kitchen with a window through which the fries are sold. The first thing you will see, is a long line of people waiting for their fries. The wait is never short and always worth it. And the kitchen is buzzing with washing, peeling, cutting, frying and double frying of the French Fries, which is kind of fun to watch while lining up. The fires are large, golden and crispy on the outside and hot and steamy on the inside. They are served in a paper cone with a large selection of sauces including tomato ketchup, curry and mayonnaise, as well as adventurous concoctions such as a mixture of raw onions and peanut sauce called “oorlog”, Dutch for war. Vleminckx is open until 6pm daily. 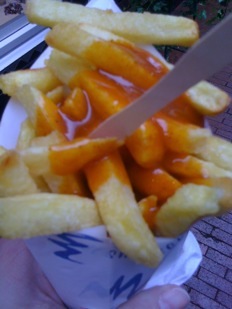 So if you’re in town shopping, drop by and get in line for a real Dutch treat of delicious home made fries! Im definitely going to try this. This will be an occasion to break my high raw vegan diet!! I am Lebanese and I was in amsterdam and i ate from your shop the best fries in the world and i would like to know how could i open a shop or a branch of your shop in lebanon. Thank you for your inquiry. I am actually just a food blogger and in no way affiliated with Vleminckx or any other restaurant I write about. You will have to get in touch directly with them.